?Beverley is a real jazz singer!? Brian Soundy (UKJazzRadio) Beverley Beirne is a jazz singer fast gaining a reputation as a truly gifted interpreter and storyteller, singing a captivating mix of standards and some beautiful though rarely sung tunes. Among these are also some incredible arrangements of well-known songs from other genres. 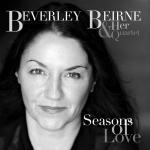 With a sell-out performance at Marsden Jazz Festival last year (2011) under her belt, Beverley is already making her mark and her debut album ?Seasons of Love? is receiving substantial plaudits from the jazz community. ?A great voice with depth and true jazz interpretation.? Brian Soundy (UKJazzRadio) Beverley?s arrangements of well known songs like ?Walk On By? make them her own. She has a wonderful feeling for interpreting numbers into a jazz context yet still keeping the original feel of the song. Supported by a top-class band with outstanding musicians, Graham Hearn (Piano), Mike Cox (Tenor Sax), Ian Mann and Adrian Knowles (Bass), Ronnie Bottomley (Drums). This is stylish, sassy jazz?! ?A young jazz singer with an individual voice and a highly creative musicality?one to watch.? Lee Gibson (Leading UK Jazz Singer & Jazz Educator). Beverley is now working on her second CD and plans for a European and UK Tour are already underway. Check out www.beverleybeirne.com for news, photo?s, gig?s and tour dates.